Galvanic Vestibular Stimulator Experiment was first exhibited at the Future is Now show at Skydive. In this experiment I am using the R/F transmitter/receiver of a remote control car to activate the switches of a GVS H-bridge circuit that changes the polarity of the current. Electrodes are put on the back of the subject's ears to activate the vestibular system in the inner ear that keeps a person's balance. By passing 1 milliamp with a current going towards one side the subject compensates for gravity moving towards the other. This piece was also exhibited at NYU DemoDays on 11/19/11. With the help of Paolo di Prodi and some amazing people at the Austin Hacker Space I created the GVS-x. 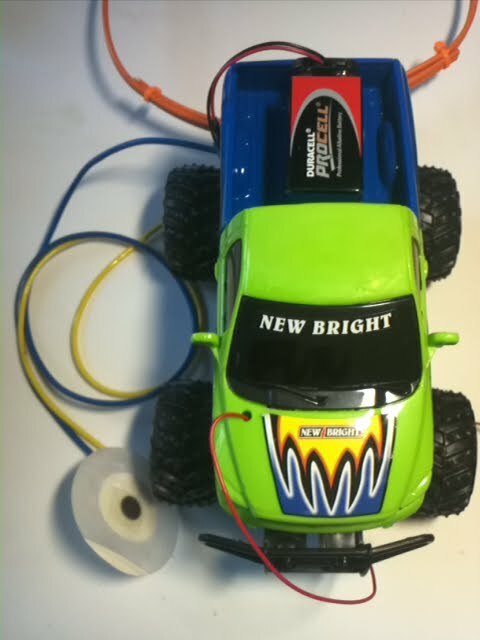 It is a galvanic vestibular stimulator meshed with a remote control toy car.